Depending on who you are, GMO is either a blessing or an evil word. Being one of the biggest hot-button issues of our time, I have been loathe to discuss it here (I may rant from time to time, but know better than to turn a happy little cooking blog into a political manifesto). That having been said, I am going to stick my toe into the water. Genetic modification is not anything new. Humans have been breeding plants and animals for desired traits for millennium. Like that Golden Retriever puppy? It is a GMO. Yup. Centuries of specific breeding has altered the genetic makeup of that dog to give you a soft, friendly bundle of love and energy. The beautiful rose? GMO. Centuries of specific breeding again gives us today’s rose. So let’s move the argument away from if something is genetically original to how the modification occurs: in a laboratory or greenhouse. Take a look at a recent Washington Post article about this debate and potential impacts on feeding the world. Check it out here. GMO or not, this was delicious! Using pre-grilled chicken makes this easier. 1. Fill a large bowl with water and add ice cubes. Cook noodles in boiling water until just tender, 2 to 4 minutes if fresh, about 6 minutes for dry (or according to package directions). 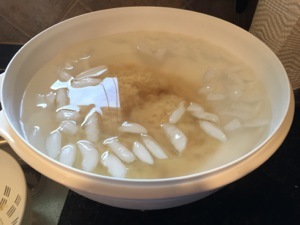 Drain and transfer the noodles to the ice water. When the noodles are cold, drain well and transfer to a very large bowl. Set aside. 2. Meanwhile, whisk peanut butter, vinegar, sesame oil and Shaoxing (or sherry) in a bowl until smooth. Add scallions, cilantro, if using, soy sauce and hot sauce, and stir to blend. 3. If using baby romaine, half lengthwise, notch out the core, and cut crosswise into 1/2-inch pieces. If using regular romaine, remove the tougher outer leaves. Halve lengthwise, notch out the core, halve again, and cut crosswise into 1/2-inch pieces. You should have about 8 cups. 4. 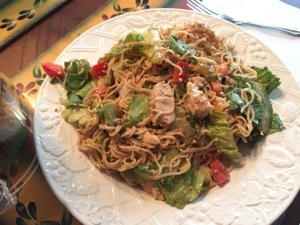 Add the lettuce, chicken, bell peppers and cucumber to the noodles. 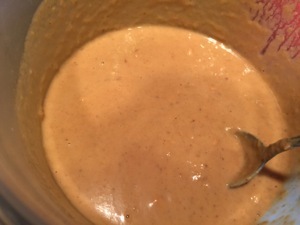 Add three-fourths of the dressing and toss to coat. Season with salt and pepper. 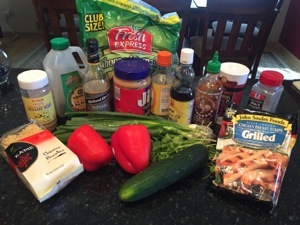 Add the remaining dressing if desired. 5. Transfer the salad to a serving bowl. 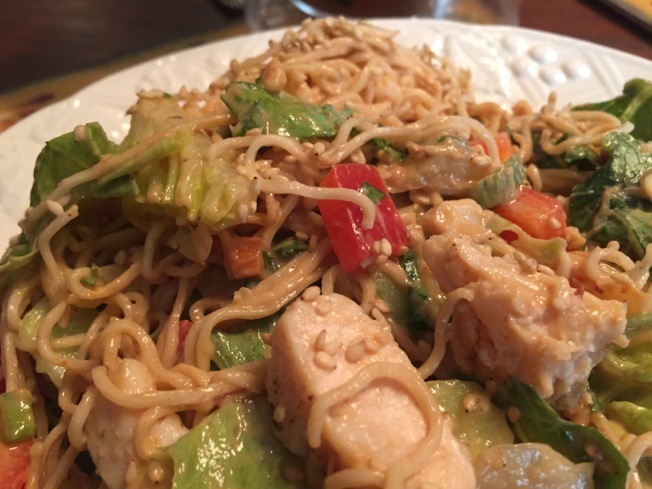 Serve garnished with sesame seeds. Nutritional Info: Per serving: 242 calories; 11 g fat ( 2 g sat , 5 g mono ); 34 mg cholesterol; 17 g carbohydrates; 0 g added sugars; 18 g protein; 3 g fiber; 312 mg sodium; 386 mg potassium. Nutrition Bonus: Vitamin A (69% daily value), Vitamin C (48% dv), Folate (19% dv). I make my living working with farmers who grow many GMO crops yet I recommend a self-sufficient lifestyle which includes some of your own food. Is that a quandary? I don’t think so. I think home grown vegtables are healthier for you as well as more tasty. On the other hand, I know without GMO foods, commercial fertilizers, and pesticides many people in the world would starve to death because farmers wouldn’t be able to grow enough crops organically to feed the almost 7.4 BILLION people alive today. Now, if you are willing to kill off about 3/4 of the population, you might can raise enough food organically to feed the survivors. Genetic modification is a process, and a beneficial, effective one at that. Having said that, not all the organisms it produces are equally beneficial. But many are just plain fantastic! We need to solve specific problems individually – not pan the whole process. Like most food-related questions, the issues are complicated.